The phenomenon of time dilation, though not noticeable in everyday circumstances, is not a mathematical trick but really exists. Corrections for time dilation are made regularly to keep the Global Positioning System from getting out of sync. The phenomenon becomes a good deal more comprehensible if we consider a network of ultimate events which does not change and spaces between then which can and do change. We are familiar with the notion that ‘time speeds up’ or ‘slows down’ when we are elated or anxious : the same, or very similar occurrences, play out differently according to our moods. Of course, it will be pointed out that the distances between events do not ‘actually change’ in such cases, only our perceptions. But essentially the same applies to ‘objective reality’. or would apply if our senses or instruments were accurate enough the selfsame events would slow down or speed up according to our viewpoint and relative state of motion. 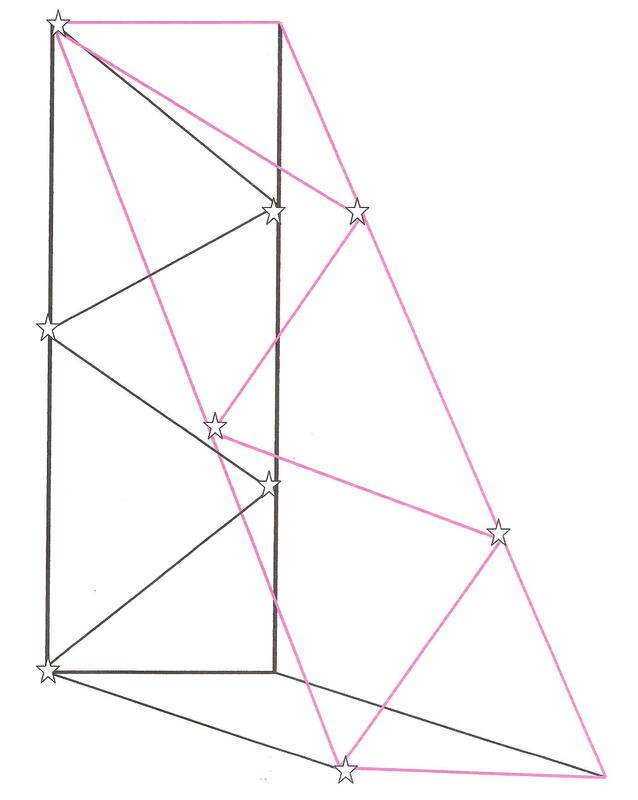 This could easily be demonstrated by making a hinged ‘easel’ or double ladder which can be extended at will in one direction without altering the spacing in the other, lateral, direction. The ‘time dimension’ is down the page.The stars represent ultimate events, light flashes perhaps which are reflected back and forth in a mirror (though light flashes are made of trillions of ultimate events packed together). The slanting zig-zag line connects the ultimate events : they constitute an event-chain. By pulling the red right hand side of the double ladder outwards and extending it at the same time, we increase the difference between the ultimate events on this part of the ladder but do not increase the ‘lateral’ distance. These events would appear to an observer on the black upright plane as ‘stretched out’ and the angle we use represents the relative speed. As the angle approaches 90 degrees, i.e. the red section nearly becomes horizontal, the red part of the ladder has become enormously long. Setting different angles shows the extent of the time dilation for different relative speeds. Note that in this diagram the corresponding space contraction is not shown since it is not this spatial dimension that is being contracted (though there will still be a contraction in the presumed direction of motion). We are to imagine someone flashing a torch across a spaceship and the light being reflected back. Any regular repeating event can be considered to be a ‘clock’. What such a diagram does not show, however, is that, from the point of view of the red ladder, it is the other event-chain that will be stretched : the situation is reversible.